Ralph Lauren isn’t afraid to experiment with new tech. Last year, the brand introduced a smart shirt for athletes, designed to measure performance with conductive silver threads and other tracking sensors. To add to this, Ralph Lauren’s announced it will begin testing interactive fitting rooms at its Polo flagship store in New York City. These smart mirrors, created by a startup called Oak Labs, are capable of recognizing a customer’s clothing pieces via RFID (radio-frequency identification) tags and displaying these on a large touchscreen. Once that happens, you can request different sizes and colors of items in your possession, which are then brought over to you by a Polo associate. From there you’re able to keep trying on different looks or simply check out — and if you don’t speak English, there’s support for Spanish, Chinese, Japanese, Italian and Portuguese. The New York-based Oak Labs, for its part, hopes to bring its technology to more apparel shops in the near future. Until then, the company’s likely feeling over the moon about teaming up with a major brand like Ralph Lauren, which is definitely not a bad start. 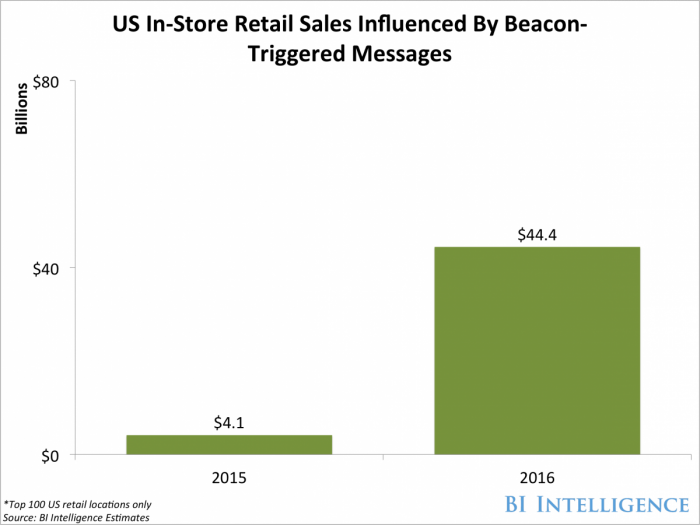 Target has been testing beacons installed in LED light bulbs to track and guide shoppers through a select number of their stores and is now expanding those trials to 100 stores, according to Lux. In-store customers can be guided to a specific product in the store by using a Target Android application that syncs to the beacons in the LED light bulbs. This IoT system will help customers find their products without having to ask for assistance from a Target employee, while also providing Target with data about foot traffic within the store. If the implementation is successful, Target would be able to reduce the staff needed to help customers find products within the stores. They’ll also be able to place certain items in high-trafficked areas. For example, if a majority of customers are searching for batteries within the store, Target could move the batteries closer to the front of the store to make them more accessible. Hari Gottipati, an independent tech consultant, saw the future of shopping in 2013. In its annual update to the software for its mobile devices, Apple had just made it possible for its phones to allow super-precise location services—and that would be a major coup for the staid world of coupons. U.S. maker of Bluetooth keyring finder Trackr has launched this week on Indiegogo a campaign to fund Trackr Atlas, a Bluetooth and Wi-Fi beacon tracker that, once placed in each room of your house – or office – can tell you where you left your keys, bag or wallet or anything else – if attached to a Bluetooth TrackR tag such as the TrackR Bravo. With these new beacons the company is solving several limitations of basic Bluetooth tracking tags.One is to find something at home without having to run around with your cellphone in search of the signal of your Bluetooth tags. The app knows where it is and the user can ask the app, Siri style, : “where are my keys?“ and get a reply such as “your keys are in your room“. Campus cards accomplish many tasks—from purchasing meals and vending machine snacks to unlocking dorm rooms and other campus facilities. A growing number of colleges and universities now offer even greater convenience, having replaced less-secure swipe cards with “contactless” cards and mobile devices that perform the same functions. In two to three years, this technology—known as near-field communication, or NFC—will be mainstream in higher education, according to research from Educause published earlier this year. NFC allows smartphones and campus cards to share information with technology readers only centimeters away. Chips embedded in each device enable contactless communication.